A private-equity consortium is preparing to launch an offer for Inmarsat months after the company aborted a bid from U.S. peer EchoStar. Handling maritime communications is shakier than a year ago while services like in-flight Wi-Fi remain risky. The deal deserves to go into orbit. 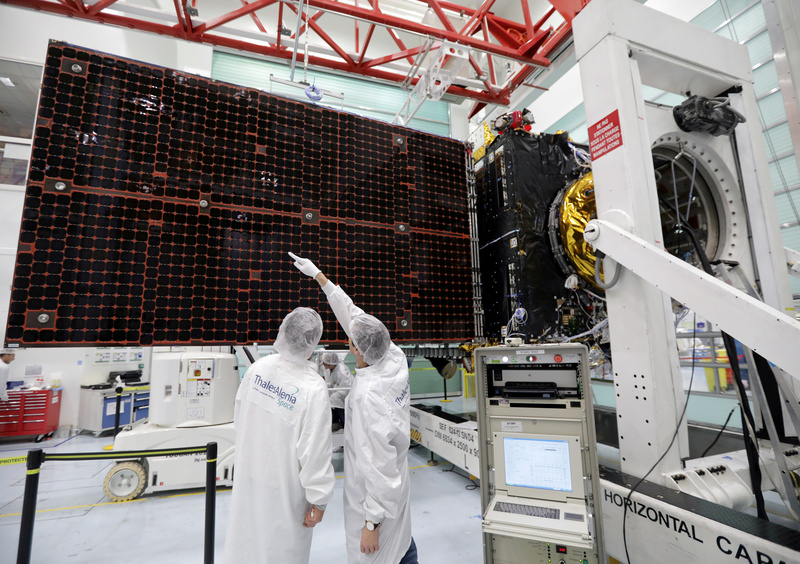 A technician looks at a solar panel on the Inmarsat S-Band/Hellas-Sat 3 satellite in the clean room facilities of the Thales Alenia Space plant in Cannes, France, February 3, 2017. Inmarsat said on March 19 that it had received a non-binding takeover proposal from a consortium led by private equity funds worth $7.21 (5.45 pounds) a share in cash, valuing the satellite operator’s equity at $3.4 billion. The consortium includes Apax Partners, U.S.-based Warburg Pincus, Canada Pension Plan Investment Board and the Ontario Teachers' Pension Plan Board. Inmarsat said the proposal came on Jan. 31, six months after Inmarsat rebuffed a $3.25 billion bid from U.S. satellite group EchoStar. The consortium has until April 16 to make a firm offer. Inmarsat shares jumped 16.5 percent to 5.09 pounds by 0845 GMT on March 20.